Hostility Towards Feminism: The Prevailing Trend? Overall, the 70s were a rather mixed bag for Madison College, as far as feminism and feminist ideals go. On one hand, there were very positive factors at work on the campus during this period, including the establishment of the Madison Women’s Caucus, which worked through the 70s and beyond to improve the standing of women among the faculty of Madison. Additionally, as a result of the work of the caucus and other groups, many wonderful feminist role models came to campus, spreading their ideas to the Madison student population. 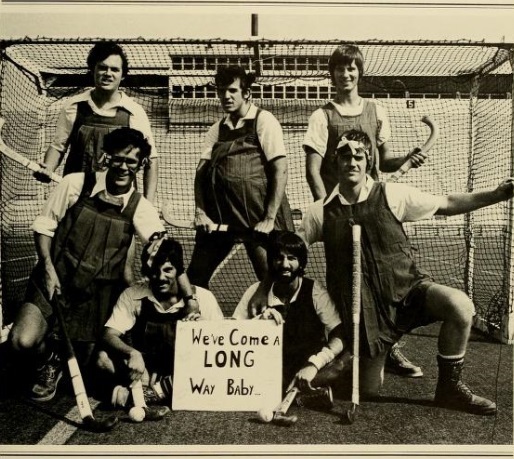 However, on the negative side of things, the 70s marked a time when increased male enrollment and the expansion of sports programs ended up having the unwitting effect of contributing to a toxic culture that not only made the college a difficult place for feminism to develop, but also endangered women’s safety. Furthermore, opportunities for women’s involvement in extracurricular activities were largely limited to those groups that celebrate and even tutored traditional femininity. However, two of the most famous and controversial feminist debates of the decade were taken up in earnest by students at Madison College- those of the Equal Rights Amendment and abortion rights. While these causes may not have inspired Madison students to traditional activism, like picket protests, it certainly inspired them to try their hand at activism with the pen. Both of these debates debated heavily through the important outlet of the Breeze (and, briefly, the short-live Genesis II). Though the campus population at large may have skewed right on both of these issues, particularly in the case of abortion, this did not stop feminist and feminist-minded individuals from getting their voice out there through the means at their disposal. While their certainly was a sense of hostility towards feminism evident in some of the heated arguments regarding the more controversial topics highlighted by the movement, hostility does not seem to correctly describe the attitude towards feminism at Madison College during the 70s. The most accurate way to describe the general attitude of Madison College to feminism is ambivalence. Despite the high profile nature of the feminist movement during this period, feminism just simply did not register on the radar of most students at Madison College during this time. This is evident by the dearth of information relating to feminism found in the college’s publications such as The Breeze and Bluestone, in contrast with the high-profile war protests of the early 70s. While other colleges in this period were creating women’s studies programs, starting feminist groups, and participating in protests in response to the feminist issues of the time, Madison College did none of this. That just wasn’t Madison.